Raise your glass to KISS! Drink with your favorite band everyday when you use the KISS Glasses Set of 2 and party every night with the Set of 6 Shot Glasses. The tapered set of two 16-ounce glasses features the KISS logo in silver on both sides with small makeup icons of each member. The outstanding set of six 2-ounce shot glasses feature an image of the original band members on one side (one band member per shot glass) and the KISS logo on each of the additional two. Being an international rock star fan is thirsty work. Take your drink on the go with the 750ml Water Bottle, 16-ounce Travel Mug, and Acrylic Cup with Straw. Quench your thirst with a stainless steel water bottle that features an easy flip open sports lid and amazing artwork of the original band members and iconic KISS logo. The 7-inch tall travel mug holds 16-ounces of your favorite beverage and sports a spill-proof lid alongside retro black and white artwork of the original band members and a 1970’s concert poster. The rock-tastic acrylic cup comes with a lid, reusable straw, and a double wall to keep your drinks colder longer. Express your rock and roll party side with the “Rock and Roll All Nite and Party Every Day” License Plate Frame! This standard-size license plate frame measures approximately 12 1/4-inches wide x 6 1/4-inches tall. The black frame is made of injection molded plastic and reads “Rock and Roll All Nite” across the top with “and Party Every Day” across the bottom with a KISS logo in each of the bottom corners all in metallic silver lettering. Don’t miss the awesome KISS-themed tin totes, perfect for fans and loyal collectors alike! The KISS-themed tin tote has striking 4-color artwork featuring images of original band members Gene Simmons, Peter Criss, Paul Stanley, and Ace Frehley on one side and theKISS logo on a distressed background on the other side. A KISS logo pattern with in bright red appears on the sides. The gift set includes a set of 4 coasters and a travel mug. The KISS Light-Up Journal is the perfect place to jot down the lyrics to your next hit song. This awesome journal is made of shiny leather-like material with the KISS logo on the spine and back in metallic silver letters. But that’s not all. The KISS logo on the front lights up! Push the button on the bottom right hand side of the cover and the running lights around the letters come on. It comes with 3 LR1130 batteries that are easy to access and change. 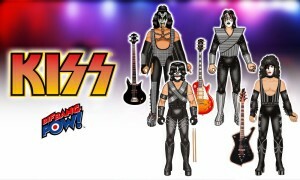 Last, but not certainly not least, are the first-ever KISS 3 3/4-inch scale action figures of the original band members! 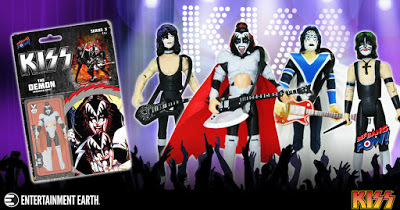 Each of the KISS Alive II 3 3/4-Inch Scale Action Figures feature detailed character-specific clothing and accessories based on the Alive II album. These exceptional figures feature 11 points of articulation. Gene, Paul and Ace each come with a guitar and Peter has a pair of drumsticks. 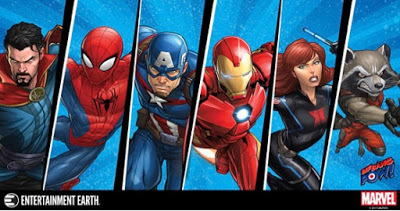 Pose each figure with his accessory in all your favorite rock positions! But wait, there’s more! Each figure comes in full-color packaging that comes with a unique drum set cut out. Collect each action figure for a complete drumset. If you’re a fan of KISS, you’ll want to collect them all!